Serenity Spa and Salon, located at the south end of the 2020 Centre away from the more energetic fitness areas, is designed with relaxation in mind. The restful interior in coastal blue and green tones are complimented by the beautiful views of water and nature. They combine to give you that special pampered feeling as you enjoy spa and salon services in our retirement community. Call 813-387-3475 to schedule an appointment. Bamboo Fusion – A luxurious, relaxing and therapeutic massage, all rolled into one, using warm bamboo. Reflexology – A therapeutic method of relieving pain by stimulating predefined pressure points on hands and feet. Swedish – Full body massage using gentle to moderate pressure, to bring about relaxation and renewal of the mind/body connection. Therapeutic – Targets specific areas of concern using deep pressure, kneading, and trigger point therapy to alleviate muscle soreness and tension. Maintain healthy hair with one of our Serenity Signature Cuts – Women’s Wash, Cut & Style, Men’s Barber Cut, Express Wash & Cut and Wash & Style. For a more youthful look add highlights, low lights, touch ups, all over color or a perm. Express Serenity – Refreshing, customized facial designed to give you maximum results in the minimum amount of time. Signature – A customized facial that is tailored to meet your specific concerns. Designed to address loss of elasticity, premature wrinkles and sun damaged skin. Age Corrective – Formulated to correct and revive tired skin with Natural Retinol Alternative that boosts collagen to help lift and tighten skin for a naturally ageless look. Vitamin C & E Antioxidant – Treat tired skin to a potent dose of antioxidant super food infusion with Citrus & Kale for supreme protection against free radicals, unparalleled healing ability and collagen boosting power. Gentlemen – Specifically designed for men to help purify, balance and restore damaged skin caused by daily shaving and the environment. Additional services – peels, waxing, eyebrow and eyelash tinting are also available. Spa – Nail shaping, massage of hands and solid color polish choice. Shellac – A revolutionary hybrid gel polish that is UV cured so there’s zero dry-time. It is chip resistant for up to 14 days of wear. Shellac is formaldehyde free. 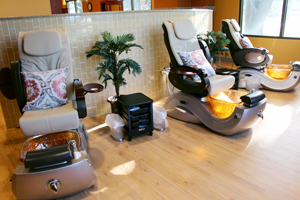 Pedicures are one of the more popular services at Serenity Spa and Salon. Pamper yourself with a pedicure while enjoying the relaxing views from the huge bay windows that look out on beautiful vistas of the water to the south of the 2020 Centre in our retirement community with spa and salon. 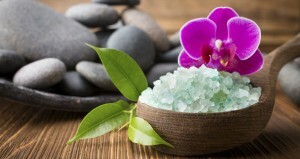 Spa – Includes soaking to soften feet, nail shaping, massage of feet and solid color polish of choice. Majestic – Nail and cuticle detailing, exfoliation with sugar scrub, foot and leg massage and polish of choice. Lavender – Lavender foot bath with nail, cuticle detailing and exfoliation. Leg and foot massage followed by a lavender foot paraffin treatment and polish of choice. Gentleman – Includes soaking and exfoliation of feet, grooming of cuticles, nails trimmed and massage of feet.